Jupiter reached opposition 3 days ago, but don’t worry … you didn’t miss anything. It’s been in great viewing position for a few weeks, and will remain an easy and impressive target for another few weeks. When any planet reaches opposition it will be located opposite the Sun in the sky. That means it rises as the Sun sets, sets as the Sun rises, and will be at its highest point in the sky at midnight. Perfect conditions for planet hunting. If you have difficulty visualizing opposition, check out my post from April 7, 2014. It shows how that geometry works, albeit with planet Mars. Jupiter and Earth are now about as close as they ever get (4.3 AU), with both planets positioned on the same side of the Sun. That’s why the view is so good. FYI: 1 AU = 1 astronomical unit = distance from Earth to Sun = 150 million km = 93 million miles. You won’t need one of my detailed charts (like this one) to help you find Jupiter. Just look to the east an hour or two after sunset. You can’t miss it. It’s the brightest thing visible in that part of the sky. And there’s only a few bright stars nearby. 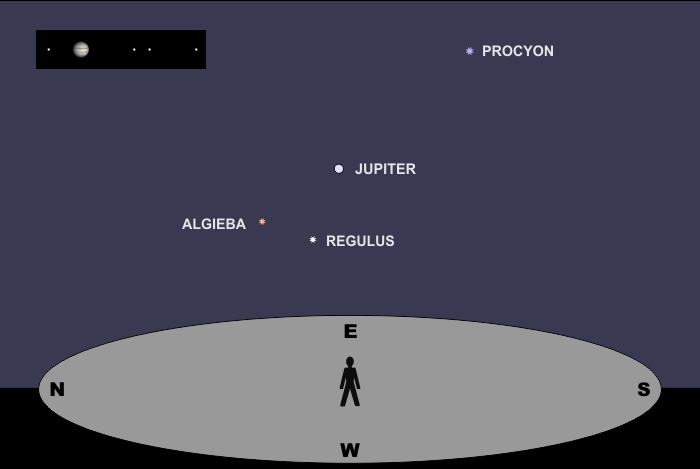 Those stars include Procyon in Canis Minor (magnitude +0.74), and Regulus (magnitude +1.36) and Algieba (magnitude +2.01) in Leo. By comparison, Jupiter is now shining at magnitude -2.5. That’s brighter than Sirius (magnitude -1.46), the brightest star in the sky. You can see Sirius tonite too, but it’s higher up, in the the southeastern part of the sky. Remember: Lower magnitude numbers are brighter. What you’ll see through binoculars (or a low power telescope) is shown in the inset at top left. 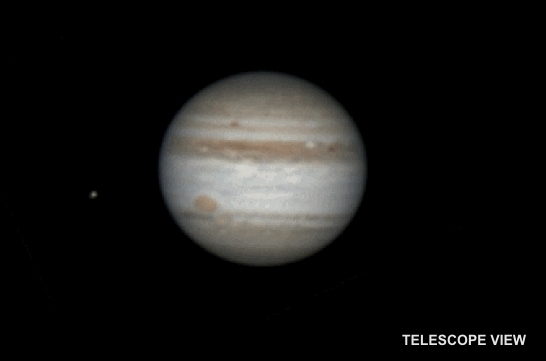 Jupiter has 4 large moons that appear as tiny points of light, approximately in-line with Jupiter’s equator. 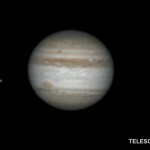 Since these moons orbit Jupiter, sometimes all 4 will be on the same side. Most of the time though, you’ll see them arranged on both sides. And occasionally, a moon will “disappear” as it passes behind or in front of Jupiter. You can use this online resource to find out where the moons will be on any given date. You should also be able to see a few thin stripes on Jupiter (described in more detail below). If you use a telescope at high magnification, the view gets a lot more interesting. Click on the thumbnail below to see what I mean. Jupiter is a gas giant planet, and the stripes you see are bands of wind that circle the planet, much like the jet streams here on Earth. With enough magnification (at least 100X), you’ll be able to see turbulence and vortices in these bands. Also visible in the image is Jupiter’s Great Red Spot (GRS), a hurricane-like vortex large enough to swallow Earth. It moves across Jupiter as the planet rotates, about once every 10 hours, so it won’t be visible every time you look. Jupiter is mostly hydrogen (90%) and helium (10%). The colors you see in Jupiter’s atmosphere come from trace amounts ammonia, sulfur, and methane. It’s not known for sure if Jupiter actually has a “surface” under all that gas, since we can’t see through its clouds. But our current best model looks like this. So grab your binocs (or scope) and take a look at Jupiter tonite. I suggest observing 2 hours after sunset simply because Jupiter will be higher up in the sky. Otherwise, nearby buildings, trees, or mountains might block your view. If you wait till midnight, Jupiter will be near the zenith (the point directly overhead).